“Can you just make it work?” All too often we receive our customers’ designs which were supposed to be ready for production, but some critical step was skipped, yet our customer had no idea. They tested some small quantity of parts, which passed, and everything seemed fine until they moved into production. One tricky root cause we have found in this situation is the tolerance stack analysis. When skipped, it is not necessarily caught until high-volume assembly, making it an expensive miss. When your project has one team responsible for the design with a separate team responsible for the manufacture, your likelihood of the step being skipped increases, so you want to be sure to be explicit about who holds the responsibility for the tolerance stack analysis. What is the tolerance stack? Part tolerances defined in isolation of one another run the risk that once all parts are assembled, they can all be within tolerance, but if they reside at the extreme edges of the tolerances, this accumulated effect, or stackup, can translate into an assembly which does not properly work. Imagine a series of floor boards with a tolerance of +/- 0.05” in width. If you lay 200 of those boards side by side on the floor, and each is at the bottom end of the allowable tolerance, you can end up with a 1” gap on the floor, which might not be acceptable even though each board in isolation was acceptable. You can read more about tolerance stackups here. The tolerances that can be achieved on a specific part are generally based upon 1) the process variation and 2) the tolerances that can be achieved in the mold. You do not necessarily need to understand the underlying contributing factors, but you do want to make sure you understand enough to know the step needs to be done, when, and why. The key is to perform the analysis and review the tolerances at each extreme with a look, not just at individual components, but on the overall assembly. Then the requirements should be updated to reflect the allowable tolerances. An example helps illustrate the point. A client with a diagnostics application recruited the Natech team to support their transfer from design to manufacture of their program. The application consisting of five mating components was designed to collect a physical sample to mix with a wet reagent and a dry reagent in preparation for an optical read. The component required a vapor seal with the mating components. Four of the five component designs had already been defined in relative isolation and were already locked. Standard tolerances had been defined as the part requirements, and molds were being built and had not yet been manufactured, so at that point the true dimensions were still unknown. If the mating features lay at the extremes of the tolerances, leakage risk would be high. This risk might not be caught during development, but over time, during production, the risk would increase, causing failures in the field. In the worst-case scenario, the company would face a recall with damage to brand reputation. To mitigate the leak risk, the Natech Engineers defined the dimensional specifications to specific nominals and tolerances with an eye toward steel-safe changes, meaning that steel would be removed in the mold to achieve the desired dimension. The Natech Engineers identified all mating components and the Critical Fits. In this case, they labeled each Critical Fit A, B, C, etc. They identified the mating components and the positions they assume when interacting. These are called Fitment Positions. 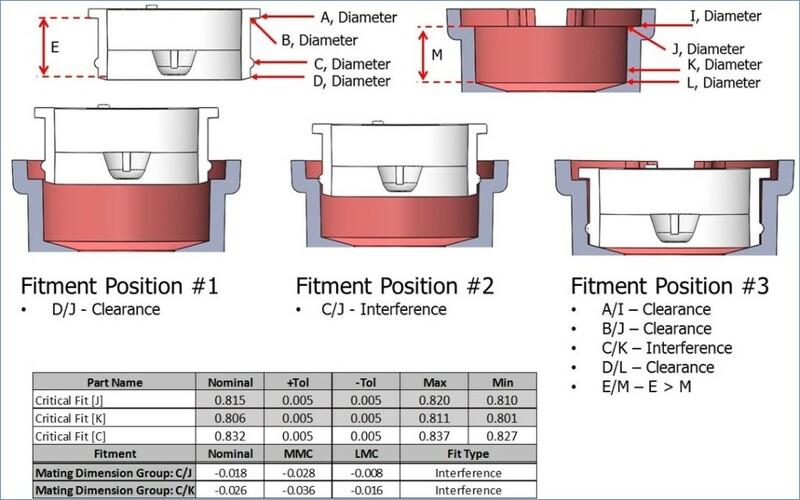 Within each Fitment Position they identified all Mating Dimensions and assigned each Mating Dimension Fit Type as either Clearance or Interference. For each Critical Fit Dimension, they listed the nominal dimension, upper and lower tolerance, and minimum and maximum allowable values. This usually starts with standard tolerancing, such as 0.005” on a feature under 0.5”. For each Mating Dimension Group, they calculated the amount of Interference or Clearance for the Nominal Dimensions, the Maximum Material Condition, and the Minimum Material Condition. A nominal of 0.008” clearance could have a Maximum Material Condition of -0.002” (interference) and a Minimum Material Condition of 0.018” (clearance). Everything up to this point served to understand the current state. Next, they modeled adjustments to the nominal dimensions as well as the tolerances to optimize the fits. This step took multiple iterations to find the optimal combination of tolerances across components. Each change impacted other fits, so seeing how each change influenced the overall assembly was critical. In this case, they decreased the nominal dimension of one part by 0.002”. The tolerances were also adjusted. Rather than having a nominal directly in the middle of the upper and lower tolerances, the upper tolerance became + 0.000” and the lower tolerance remained at -0.005”. This specification communicates to anyone looking at the drawing that the dimension is preferably at the top of the specification but absolutely cannot go over. The moldmaker knows to start smaller on this feature and increase as needed, which is a steel-safe change. This gives a Nominal Clearance with the mating component of 0.010” with a Maximum Material Condition of 0.005” (clearance) and a Minimum Material Condition of 0.020” (clearance). This achieved the needed fit. Bad tolerancing slows projects and increases costs. Too many times we have received requirements with only standard tolerances across the board, arbitrarily tight tolerances, or (worst of all) no tolerances at all. You always want to bear in mind that the human bias during design is to tend toward tighter-than-necessary tolerances. This can happen either from a desire to protect oneself by being overly conservative, the human tendency toward pride in designing high-criticality applications, or from organizational laziness. Unnecessarily tight tolerances can result in more expensive molds, unnecessary corrective actions, and ultimately higher piece prices. In our experience, a majority of the time critical fits can be addressed not with tightened tolerances but with a thorough tolerance stack analysis. Tolerance stack analysis is a specific skill which requires experience. An expert tolerance stack analysis can result in fewer changes after first samples. Any changes that are needed should be changes in the right direction, meaning they are steel-safe changes. Some manufacturers will just build what is handed to them without offering the expert analysis, so the customer discovers the issue when they assemble parts or worse when they move into production. This is more expensive, slower, and riskier than performing the analysis in advance.